There are two camps when it comes to Christmas trees, those who like the convenience of an artificial tree and those who can't imagine Christmas with anything but a live evergreen tree. The ones who put up artificial trees cite a whole list of benefits: It is much easier overall, there are no needles on the floor, you don't have to dispose of the tree after the holidays, you don't have to water it, the lights are often already on the tree when you buy it, you can keep it up longer since it doesn't dry out, and there is zero chance of a fire. But for some, despite the relative ease of an artificial tree, it is just not Christmas without a live one with its evergreen scent infusing the whole house and that sticky feeling on your fingers after you've finished layering on the lights, garlands, and ornaments. Part of the whole live-tree experience is buying it. You can go to a tree lot in Vancouver and know that what you spend will benefit various charities or you can go to a Christmas tree farm and either buy a cut tree from that farm or pick and cut your own. These are some options in the Vancouver, B.C. area. Every tree that's sold at Aunt Leah's Trees raises money to help children in foster homes and mothers in danger of losing custody of their children. So buying a live tree at Aunt Leah's is truly in the spirit of Christmas. The lots are in Vancouver (Kerrisdale-Marpole), Coquitlam, Burnaby, North Vancouver, and Vancouver-River District. There are also pop-up lots that will be listed on their website closer to the holidays. Dates were not available at the time of writing; check the website toward the end of November for the dates the lot will be open. 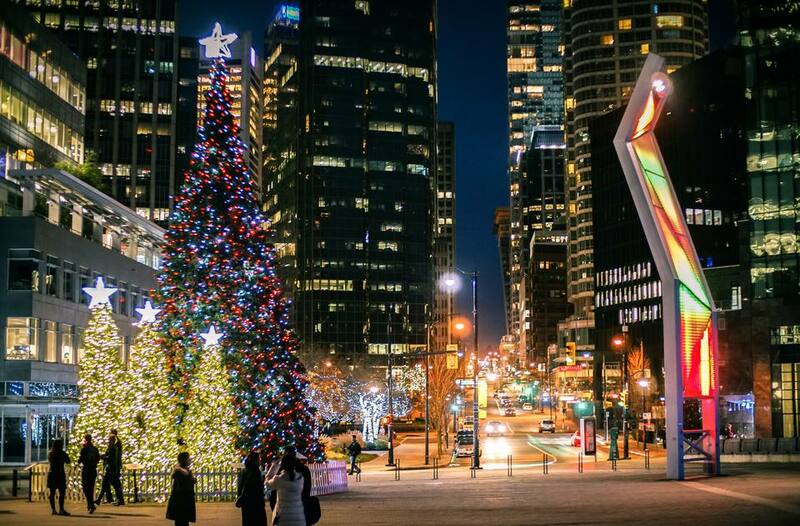 Yaletown's holiday festival kicks off the season in late November. Mainland Street will be the scene of festive shopping, live entertainment, artisans, street performers, horse and carriage rides, and visits from Santa. In the midst of all this holiday fun, you can pick up a live Christmas tree at CandyTown's Christmas tree lot. Every year the South Vancouver and Richmond Lions Clubs operate a Christmas tree lot and donate every cent they make to the community. You'll find Douglas and Fraser firs, along with Plantation firs, Grand firs, and blue spruce. All their trees are grown in Canada. The British Columbia Christmas Tree Council lists member farms from all over British Columbia. Most Christmas tree farms open on the Friday after Thanksgiving and are open up to Christmas Eve. Some are only open on weekends or only have hayrides, Santa visits, and festivities on weekends. What Is Vancouver Like in February? How to Find a Family Doctor in Vancouver, B.C.